Standing majestically on the green, our church whose spire can be seen for miles as one enters downtown Lee, welcomes visitors to Lee and Berkshire County and continuously reminds Lee residents of our town’s rich history. It all began in 1777 during the American Revolution when a group of fishermen and their families from Cape Cod made their way over the mountain barriers of the Berkshires to start the town of Lee. The British navy had forced them out of their fishing grounds. In 1778 at the second town meeting of the recently-incorporated Town of Lee, the assembly voted “to raise the sum of 30 pounds sterling lawful money, to be laid out in preaching the Gospel.” This was the first sum of money that the town voted to raise. A meeting house was built in 1780 on the south side of the church green; today the site is marked by a Lee marble stone marker. The meeting house had no glass in the windows for several years, no stationary seats, no heating whatsoever. Services were two hours long in the morning and two hours long in the afternoon. In 1800 a more pretentious edifice was built about two hundred feet north of the meeting house at a cost of about $3500. In January 1857 in below freezing weather, a burning shingle from a building burning on Main Street blew into the steeple and caused the church to burn to the ground. When the church members realized they could not save their church, they decided to save the parsonage, newly built in 1851 at a cost of $3000. They took all of the furniture out of the parsonage and soaked the roof to keep the fire from spreading. 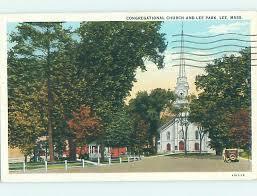 The redoubtable congregation laid the cornerstone of the current Lee Congregational Church in the summer of 1857. It is an unusually fine example of Romanesque style of architecture and it is the dominant feature of the green on which it stands. The wooden frame steeple is reputed to be the tallest in New England. A 2,000-pound bell hangs below it in the bell tower, and the Seth Thomas clock system tolls every hour. The clock is still wound weekly by hand. 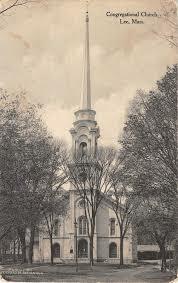 After the church was built it became a favorite item of gossip in other Congregational churches in the Berkshires because it was too ornate and fancy. Our church had not only cushions but of a rich wine color. The cushions today are stuffed with the original horsehair but have new covers. More scandalous yet, for those days, the church hired itinerant French and German artists to paint trompe l’oeil (“fool the eye”) pillars and carvings around the sanctuary. They flanked the lectern with apparent marble columns, embossed the ceiling with painted marble rosettes, and hand-painted wood graining on the pews, the wainscoting and the balustrades in the gallery. Our church may be the only church to have such paintings. Some churches, with similar art work, painted over the decorations, and other churches burned down. The old gas lights, now electrified, still hang, from the ceiling.